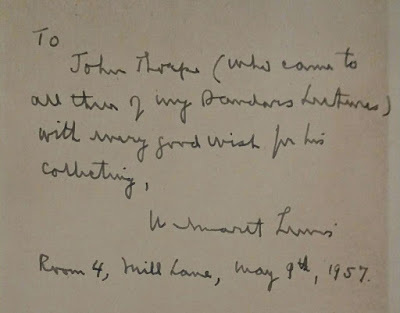 Wilmarth Lewis’ classic autobiographical account Collector’s Progress is well represented in my library in multiple association copies, many important, but none as charming as this example. I purchased the book recently on Ebay for a nominal sum using Ebay “bucks” – in effect rewards credit for other purchases—that was about to expire. Use it or lose it. The recipient was not noted by the seller but the price so tempting I ordered it on a whim and let the dice roll. . . .
Wilmarth Lewis. COLLECTOR’S PROGRESS. London: Constable & Co Ltd., . xxiii 245 p. Plates. 8vo. Blue cloth, spine stamped in gilt. Notes: First UK edition, with a preface for the English reader (pp. vii-ix) not found in the American edition. 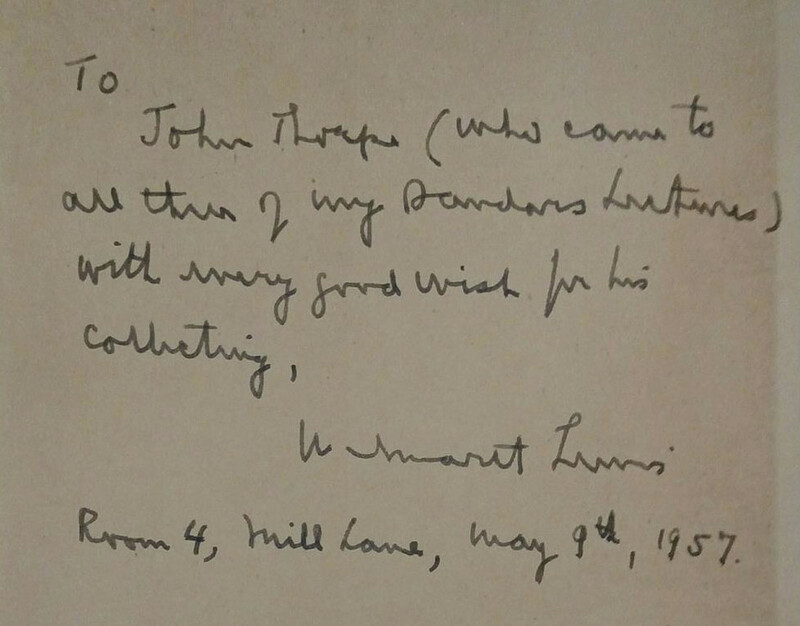 Lewis writes in One Man’s Education, “In 1957 [Lewis] became the Sandars Reader in Bibliography at Cambridge, the second American to be elected to the Readership since its establishment in 1895. A liberal interpretation of ‘bibliography’ was necessary to make him eligible, but he felt safe in his subject, ‘Horace Walpole’s Library.’ The Reader spent six months on each of the three lectures, which were given on successive days at five following tea, the ideal hour for lectures in England when the audience is cheered but not inebriated. . . The audience got to nearly sixty each day; very good, the Reader was told, for a Sandars Lecture. I love John's question to Mrs. Lewis and his answer back to her!